This interesting and unusual surname, recorded as Adshead, Adshed, Adshede and Adshad, is of Anglo-Saxon origin, and is locational from a now "lost" place thought to have been situated in Cheshire, near Prestbury, due to the large number of recordings in this county. An estimated seven to ten thousand villages and hamlets are known to have disappeared in Britain since circa 1100, due to such natural disasters as the Black Death of 1348, in which an eighth of the population perished, or to the widespread practice of "clearing" large areas of land to make sheep pastures, during the height of the wool-trade in the 15th Century. 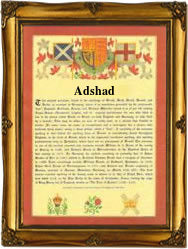 The placename is derived from the Olde English pre 7th Century "Addesheafod" or "Eddesheafod", and means "headland of Addi or Eddi", derived from the elements "Addi" or "Eddi", a personal name of uncertain origin, and "heafod", meaning "a head(land)". The surname is found recorded in Cheshire as Adshead, Adshed and Adshede, and it is also particularly well recorded in the bordering county of Lancashire. Recorded on the Cheshire Church Registers are the christening of Thomas Adshead on July 3rd 1573, at Prestbury, and the marriage of Reignold Adshead and Margarett Andrew on February 12th 1597, at St. Mary's, Stockport. The first recorded spelling of the family name is shown to be that of John Adshead, which was dated February 5th 1560, marriage to Anne Green, at Prestbury, Cheshire, during the reign of Queen Elizabeth 1, known as "Good Queen Bess", 1558 - 1603. Surnames became necessary when governments introduced personal taxation. In England this was known as Poll Tax. Throughout the centuries, surnames in every country have continued to "develop" often leading to astonishing variants of the original spelling.